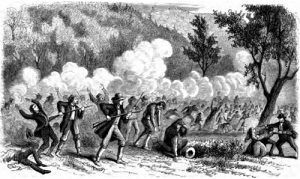 On September 11, 1857 approximately 120 men, women, and children in a wagon train from Arkansas were murdered by a band of Mormons set on a holy vengeance. Known as the Mountain Meadows Massacre, the history of this event continues to generate fierce controversy and deep emotions even to this day. In April, the California bound wagon train assembled near Crooked Creek, Arkansas, approximately four miles south of present day Harrison, Arkansas. The group included some 120-150 men, women and children, primarily from northwestern Arkansas, as well as hundreds of draft and riding horses and about 900 head of cattle. When the train began its journey it was first identified as the Baker train; however, en route, it became known as the Fancher train. 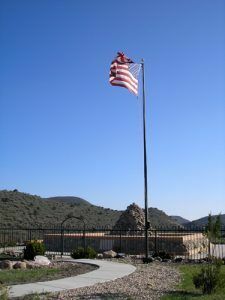 Mountain Meadows Massacre Site. Click for prints, downloads and products. These actions contributed to a general distrust of outsiders and non-Mormons as the Mormon people feared their own destruction by the federal government. As a result, Brigham Young issued a proclamation of martial law on August 5th which, among other things, forbade people from traveling through the territory without a pass. In addition, the citizens of Utah were discouraged from selling food to immigrants, especially for animal use. It was into this atmosphere that the weary emigrants arrived in Salt Lake City on about August 10, 1857. A critical stop, the wagon train needed to refurbish their equipment, refresh themselves and their stock, and replenish their supplies. The once friendly Mormons, usually eager to trade agricultural commodities for manufactured goods, were now hostile and reluctant to trade. However, they were soon told by a Mormon guide that they should take the southern route because the northern route was dangerous due to Indian attacks and had the potential for severe winter weather, while the southern route provided for more fodder for their stock and less danger. The leaders of the train made the ill-fated decision to retrace their steps and take the southern route. However, there were some in the group who decided to continue the path along the Humboldt River. The train was divided with the understanding that it would later be reunited. Though the vast majority of the train members headed southward, most historians believe today that the group easily could have made the northern trek with little difficulty. And in fact, those that did, including Malinda Cameron Scott, and her children, along with the Page Family and others, did successfully make the trek, arriving safely in California in October, 1857. As the Fancher train moved south without a pass from the Mormons, contact with the local settlers became more abrasive. Rumors began to circulate that among the Fancher party were members of a mob that killed Mormon founder Joseph Smith, Jr. years previously. The rumors were embellished with each telling and by the time the wagon train reached Cedar City, reports of gross misconduct were believed. With hungry bellies and injured feelings, the Fancher train proceeded through Cedar City westward as the locals held meetings to determine what was to be done about the interlopers. At the edge of the desert between Utah and California, about thirty-five miles southwest of Cedar City, the wagon train stopped to rest and recuperate for several days in a meadow surrounded by numerous springs. In the meantime, the militia back in Cedar City had decided that the Fancher train should be eliminated. At dawn on September 7, 1857 the travelers were besieged by Mormon-allied Paiute and militiamen disguised as Indians. Though the wagons were drawn into a circle, making a strong defensive barrier, seven were killed and sixteen wounded in the first assault. For the next five days the siege continued while the wagon train resisted. On Thursday evening, September 10th, Major John M. Higbee handed John D. Lee orders from Colonel Isaac C. Haight in Cedar City to “decoy the emigrants from their position, and kill all of them that could talk. On Friday morning, September 11, 1857 John D. Lee carried a flag of truce to the encamped wagon train. The party, low on water and ammunition, welcomed the militiamen believing that they had arrived to save them. The emigrants were made an offer to leave all of their possessions to the Indians and be conducted safely back to Cedar City. Eagerly accepting the conditions, the small children and wounded were placed in the wagons, followed by the women and older children walking in a group. The men trailed the women, walking alongside their armed militia protectors. After having traveled about a mile and a half, Major John M. Higbee rose up in his stirrups and shouted “Do your duty!”, whereupon all but the young children were slaughtered, either by their armed escorts or by hidden Paiutes. An estimated 120 unarmed men, women and older children were killed; 17 of the younger children under the age of seven were spared.